We are all affected by our immediate context and its political, environmental, cultural, and temporal influences. Climate Shifts juxtaposes various locations around the globe and their points of view through local news headlines and weather data. Differences in concerns and perspectives emerge, sometimes about the same world events, allowing a glimpse into the collective psyche of each place. How do news sources in different regions interpret an election? What are the primary concerns in Beirut versus Jerusalem? What events in Asia echo in Latin America? When financial or health crises strike, what patterns of response are similar or different across the globe? 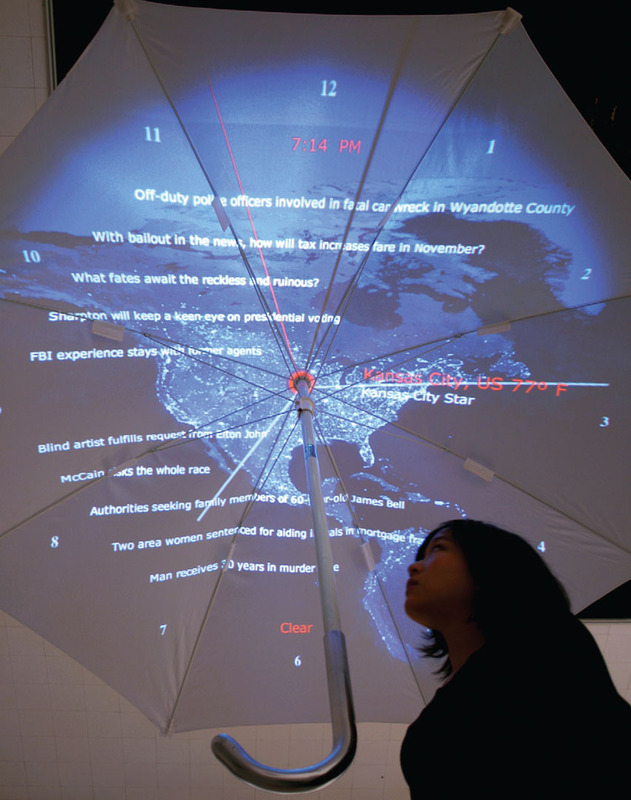 A large umbrella acts as an overhead screen upon which animations shift through various destinations, with the top of the umbrella pole acting as a locator. Climate news, weather, and time are gathered from real-time RSS feeds and layered over an illuminated light-pollution satellite image of the globe. Similarly layered, time is reflected by clock hands that spin and adjust according to the time zone of the current location. Funded in part by a Fellowship from Sculpture Space, Utica, New York and a Fine Arts, Humanities, and Social Science Grant.